Along with normal extruded rubber products, Lusida Rubber also specializes in manufacturing dense rubber and closed cell sponge rubber with metal inserts. These products are extremely useful as they provide the softness and flexibility of rubber along with the strength and rigidity of the metal inserted. 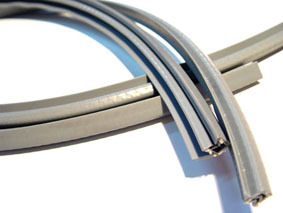 Whether you need custom or standard, Lusida Rubber can deliver to your specifications on time and at the right price.